Roulette is that enigmatic and entrancing casino game where the ball is spun in the opposite direction to the wheel and everyone holds their breath to see where the ball stops. That’s all there is to it; although it takes a lot to become totally skilled at it , the player basically just stands breathlessly waiting for the wheel and then the ball to come to a stop, and pray that is has landed on the number and/or colour they have chosen. While the likes of poker have always been seen as the poor relation as far as gambling is concerned, roulette has always been thought of as something of a rich man’s folly. People dress up to the nines and travel the world to the swankiest casinos to watch the wheel spin. There can be the price of a house sitting on a single number or colour, and this isn’t a game to play if you are worried about losing. 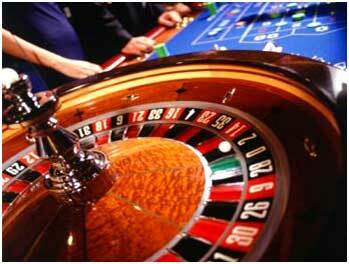 There are numerous combinations of bets that can be placed at the roulette table. As well as the numbers you can place your bet on red or black, odd or even, and as the numbers are split into columns and many other multiples this is not a game for the faint hearted. Covering bets with others and still coming out a winner needs patience, practice and a bottomless pocket. Due to influx of casino programmes that now fill the void between shut down and breakfast shows, and the interactive element where you can play along online, roulette is gaining a whole new generation of fans. Online gaming is also big business, and an internet search of casino websites will bring up hundreds of thousands of results. These are a good introduction the casino games without leaving your living room; this gives the amateur good practice at the various games and explains the rules simply. Gambling Mecca’s such as Las Vegas which have a casino on every corner that combine great games, slots, hotel rooms and floor shows. These are all in one entertainment venues that beg to be visited. Las Vegas is one of those places that everyone should visit at least once in their lifetime, and whether you are a gambler or not, al little flutter never did anyone any harm. At the end of the day, gambling can be a pleasant past time or an all encompassing addiction, depending on your personal psyche. Roulette is a game of luck, and taking your chances while at the same time staying in control. It is one of the most fascinating of casino games, and has that air of finesse about it in the way that the croupier spins the wheel, and when it does we aren’t in our sitting room, we are in Monte Carlo.